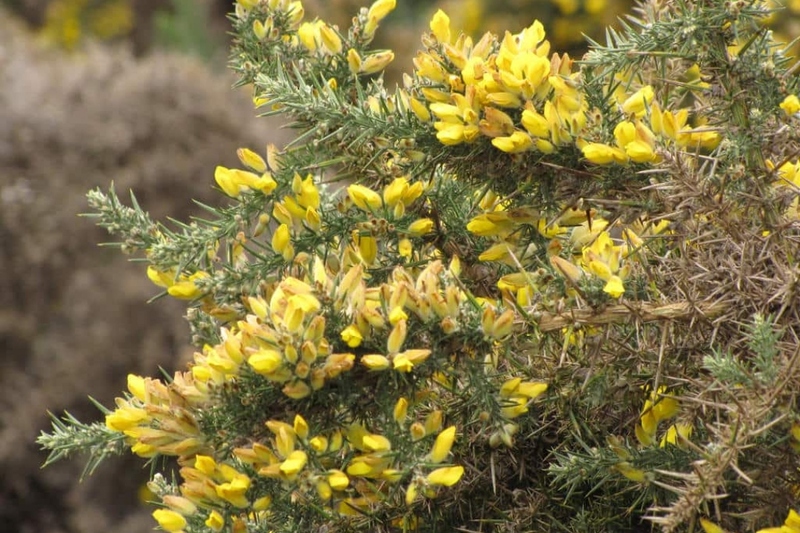 Gorse (Ulex europaeus): growing, planting, caring. Ulex europaeus - gorse, common gorse, furze or whin - is a species of flowering plant in the family Fabaceae and native to Europe. The gorse is a very vigorous evergreen shrub growing to 2-3 meters that lives happily in poor, dry and acid soil - a moor, so to speak. Planted in a rich soil it becomes rather lanky. Its maintenance is easy - just a cutting here and there - but beware of its spikey bits! The young stems are green, with the shoots and leaves modified into green spines, 1–3 centimetres (0.39–1.18 in) long. Young seedlings produce normal leaves for the first few months - these are trifoliate, resembling a small clover leaf. The flowers are yellow with the pea-flower structure typical of the Fabaceae. Gorse tolerates frosts to -15 ° C.
The gorse is a very thorny shrub that spontaneously takes a wide habit- 1.5 x 2.5 meter high - making it usable in hedges. It is usually found on the moors. The spines are very numerous, branched, and replace the leaves to ensure photosynthesis. In fact, it is the leaves themselves that form these spines by stiffening. The spring flowers are golden yellow, they measure 2 cm and are "papilionaceous", with 5 petals that form like two beaks. They easily attract bees. Gorse trees tolerate frosts up to -15 ° C.
Plant the gorse from October to March out of freezing period - a planting before the winter allows a better rooting - in a sunny situation. Gorse prefer acidic soil, poor and draining. It will refuse growing elsewhere. In hedge, separate by 1 m for a hedge about 2 m high. Before planting, prune damaged roots and branches to balance root volume and aerial volume. Plant in a hole at least twice as big as the root ball. Soaking the roots before planting will greatly improve the chances of recovery. Plant being careful not to bury the base of the trunks. Form a bowl around the base that will be used for watering during the first months. Tamp the soil around the roots - do not hesitate to use all the weight of the body! Finally water until filling the planting bowl, at least two watering cans! Trim your gorse in hedge in spring and in fall. Trim twice a year to never work on large twigs, and have a better result. The first years be patient, cut closer to the trunk than what you plan in the long run. For isolated gorse, the principle is totally different! Only trim once a year, and remove the forks from the center branches to let the light in. If necessary, you can also shorten the outside branches with a pruner, not a hedge trimmer!